Hey, I Like Your Dessert! 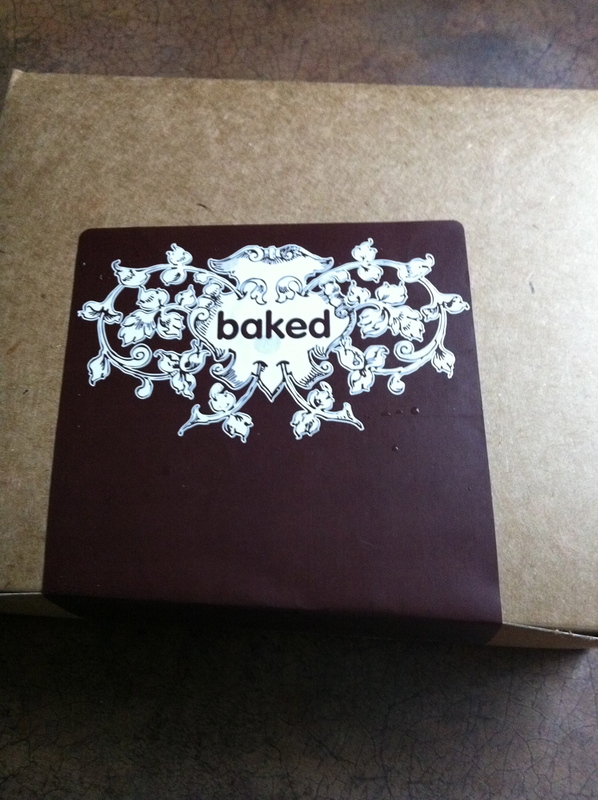 Matt and I headed back to Red Hook for some foodie goods and this time I made sure to stop by Baked on Van Brunt Street. I was not disappointed. Miraculously, I managed to make it home before I cracked open the box (maybe that’s because I had just eaten a lobster roll and mini-key lime pie). We bought a Nutella cookie, a sweet and salty brownie, and the big winner… the salted caramel bar. Upon taking my first bite of the salted caramel bar, I said, “Oh. Oh wow. 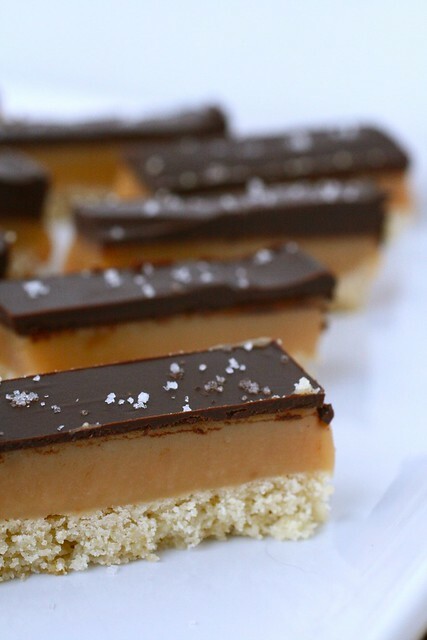 That is very, very special.” A shortbread bottom, caramel middle, and chocolate top, sprinkled with flaked sea salt. Heaven. 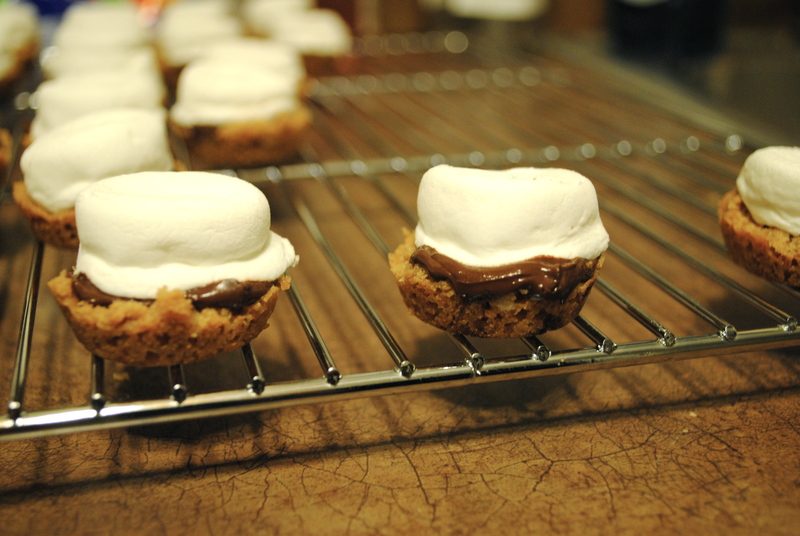 Baked has a few cookbooks out so many of their recipes have made their way onto the internet. This one in particular looks promising. Heads up, it has five sticks of butter. FIVE. 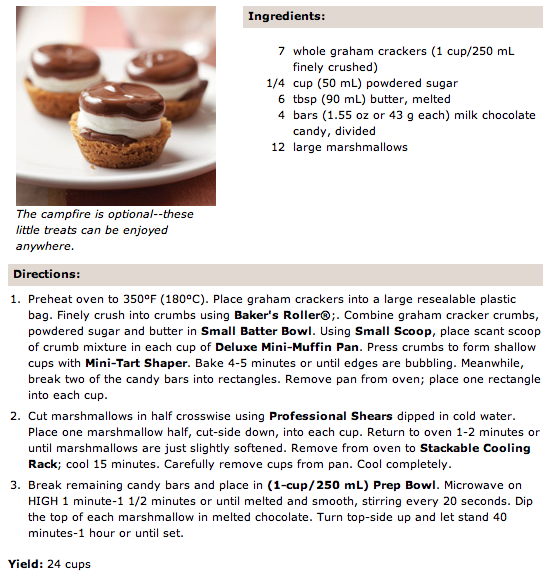 Hey all – I’ve been a busy bee in the kitchen lately trying new some recipes and whipping up some of my favorites. Nothing original, just scouring the web and tweaking where necessary. I thought I’d share and hopefully inspire you to get your booty off the couch and in the kitchen! Ina Garten’s Roasted Tomato Basil Soup – Great for summer because you can eat it cold. In a few months enjoy a happy winter weekend by eating it warm with a grilled cheese sandwich. Yum. My tweaks: use half the salt it calls for (Ina Garten if you’re reading this, your cardiologist called, stop using so much salt) and use low sodium chicken stock. Slightly annoying that you have to run this through a food mill. If you don’t have one you could get around that step by removing the tomato skins after you roast them and then running the soup through a blender for a few seconds. You won’t get quite the same consistency, but it would be ok in a pinch. Ina Garten’s Chicken Salad Veronique – This is chicken salad jazzed up with green grapes and tarragon. I typically don’t like tarragon because it has an anise (licorice) flavor, but it really works here. Again, go easy on the salt. This salad is great on a crispy ciabatta bread. Giada De Laurentiis’s Baked Penne with Roasted Vegetable – This was surprisingly SO good. The recipe calls for two zucchini and two squash but just use two squash (unless they are freakishly small). There was no way four would have fit in the pan. I didn’t have the dried Italian herb mix it called for – actually that’s not true, I found a jar of it that expired in 2008 – so I just made my own. I combined dried thyme, rosemary and oregano and it was fine. I also used plain mozzarella instead of smoked. Ina Garten’s Tabbouleh Salad – I made this for the first time about a month ago and I’ve made it four times already. I can’t get enough of it and it’s actually healthy. Great on its own but even better in a warmed up pita. When I saw Ina G make it on her show, she used chicken stock instead of water so that’s what I did the first time. Never again. The chicken flavor was a terrible match for the lemon, herb and vegetable flavors. Since then I just do what the original recipe says and use boiling water. Aside from a little bit of olive oil, there is no fat because it’s just herbs, veggies, and wheat bulgur (very healthy grain that has the consistency of couscous). I also like to add a little avocado just before serving. That negates the no fat thing but come on, it’s avocado! 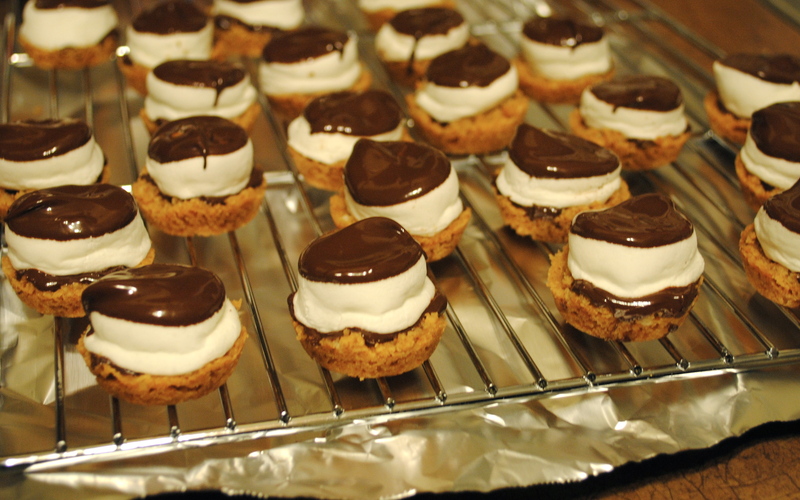 This recipe comes from the inside of a Philadelphia cream cheese package from more than ten years ago. I even used the ten-year old cream cheese IN the recipe. Kidding. I know it used to be available on the Philadelphia (Kraft Foods) website, but I couldn’t find it, so you’ll just have to trust me! 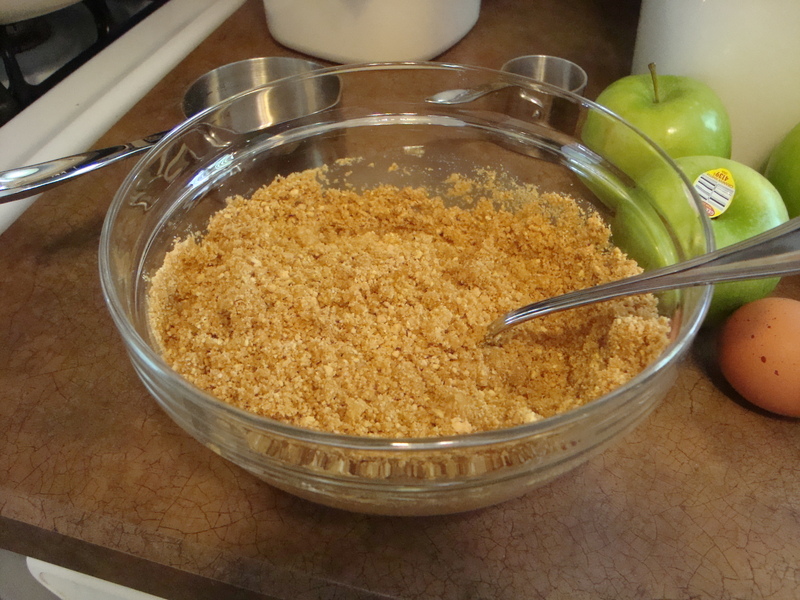 Combine the melted butter, graham cracker crumbs and 1/4 cup of sugar in a bowl. Use a fork (or the forks God gave you, your hands) to combine the ingredients until the crumbs are moistened and can be pressed into a crust. Press onto the bottom of a rectangular pan (13 x 9-ish). 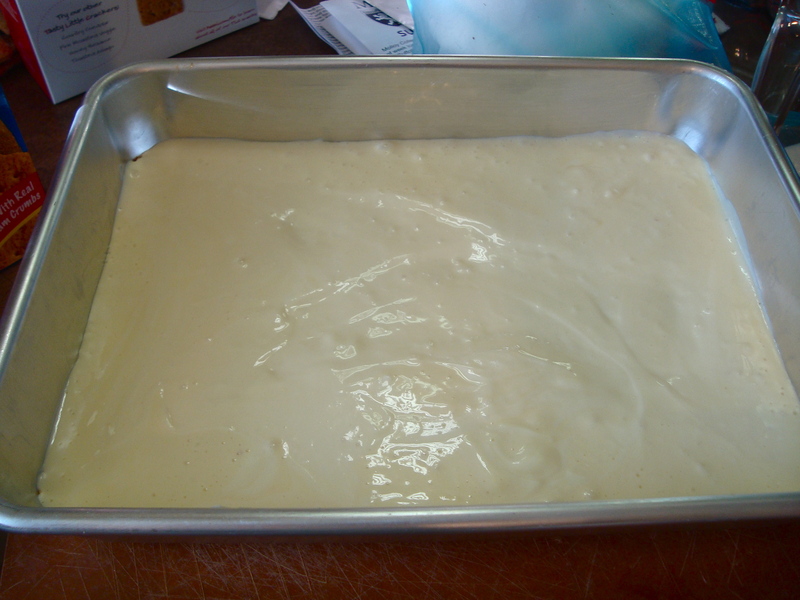 To soften the cream cheese, microwave for 15-second increments until it’s soft but not melted. 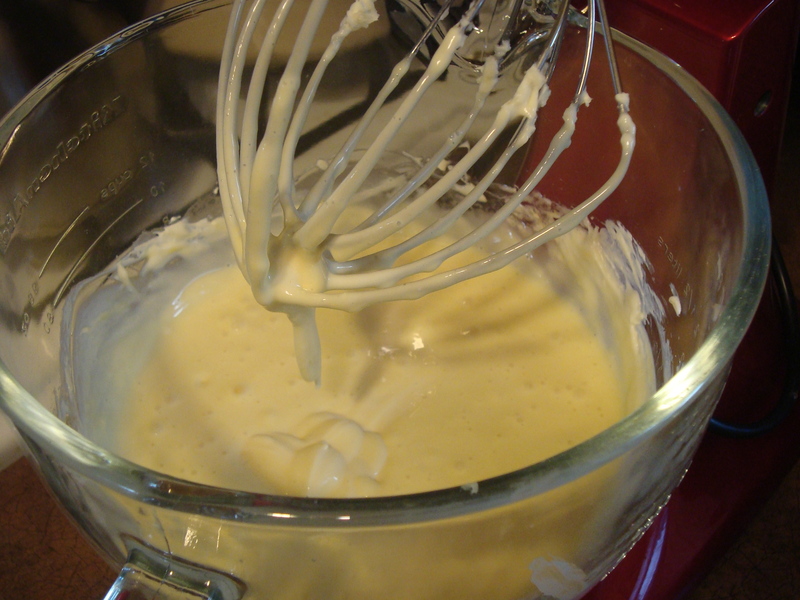 With an electric mixer, combine the cream cheese, 3/4 cup of sugar, and vanilla until blended. Add eggs and mix until combined. Stir in mashed banana and pour batter over crust. 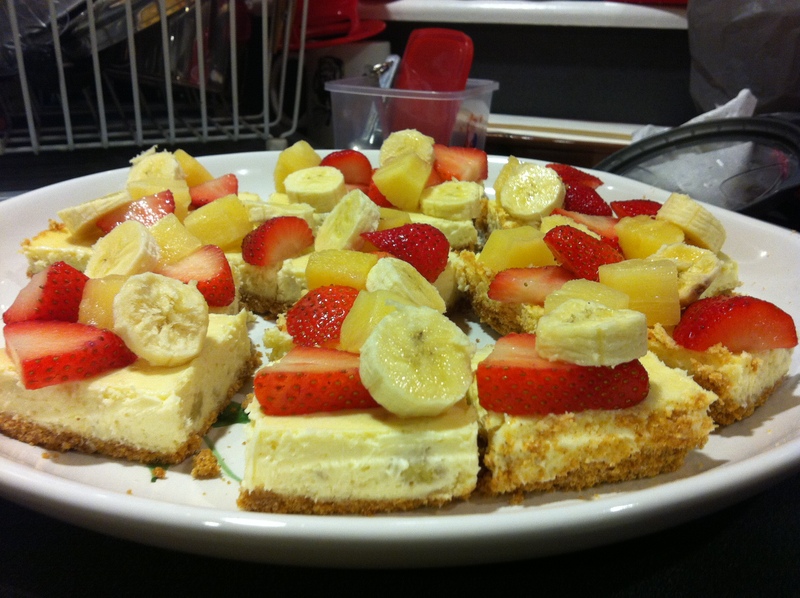 A note about the banana: even people who don’t like banana, like this cheesecake. The flavor is so mild most people don’t even realize it’s banana. This is the mashed banana. I mashed it with a fork in a Pyrex cup. Bake for 30 minutes – the edges should look done but the center can be a LITTLE wiggly. It’s important not to undercook cheesecake so if you’re unsure, give it another 3-5 minutes. Cover and refrigerate for at least three hours. Cut into bars and top each piece with a strawberry half, banana slice and pineapple chunk. Graciously accept compliments from all who taste it. 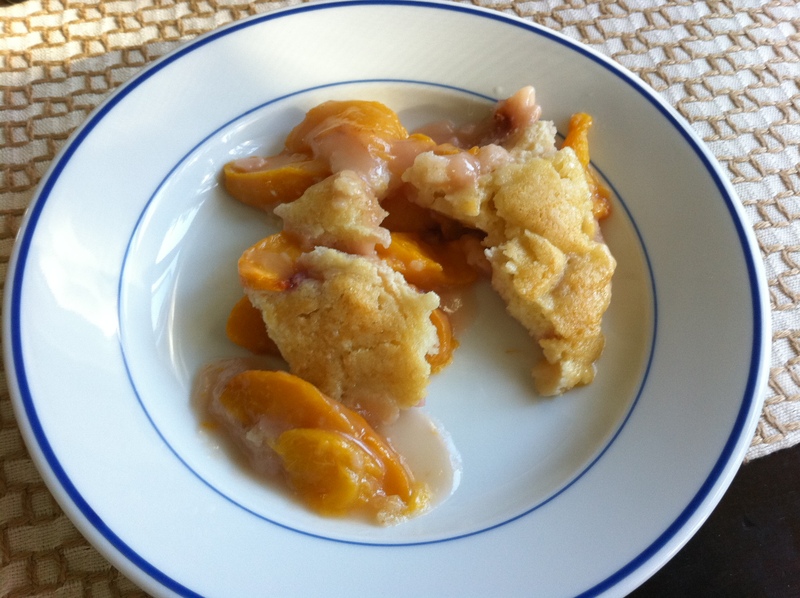 Fresh peaches are such a treat and now is a great time to get them. To tell if they’re ripe, smell the spot where the stem is (was). If it smells peachy, it’s good. A few years ago I went to see Katie Lee Joel do a cooking demonstration at the Viking Cooking School (formerly Loaves and Fishes) in Garden City. At the time she was married to Billy Joel but in case you hadn’t heard, it didn’t work out. Big surprise there. She was gorgeous and friendly and lovely. 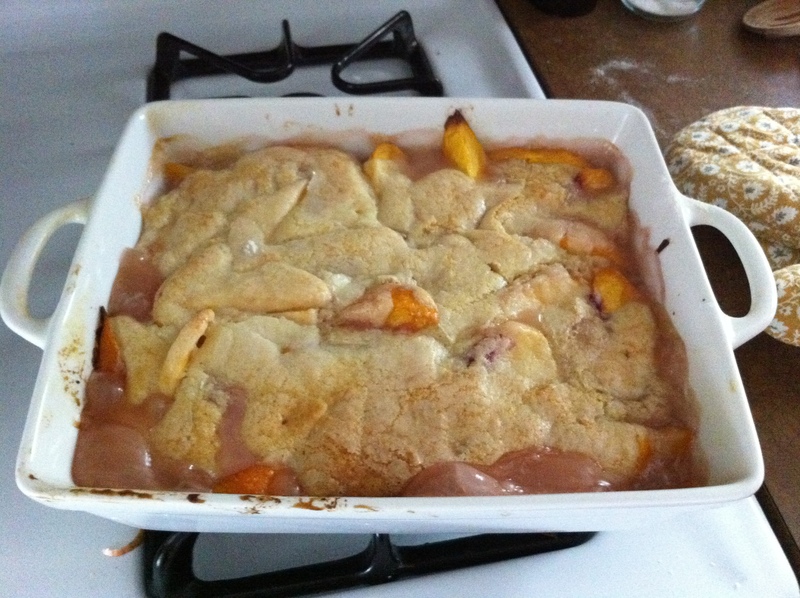 I bought her cookbook and one of my favorite recipes is the peach cobbler. 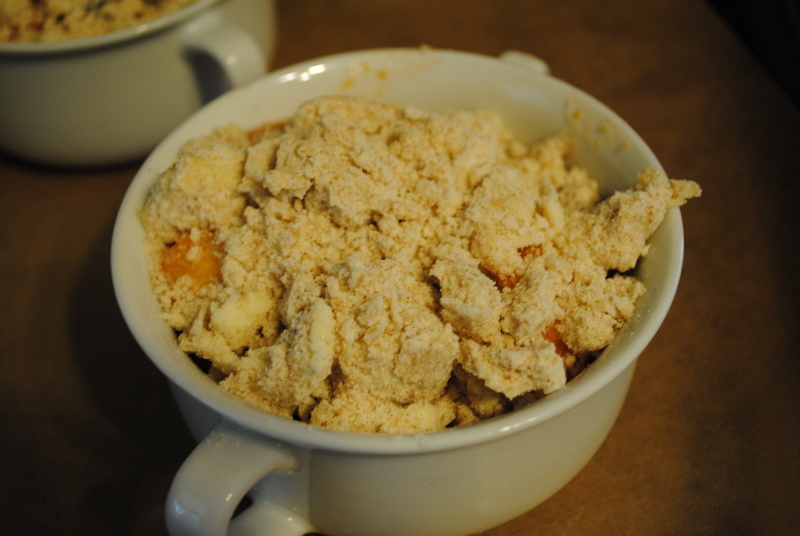 The topping is more like a biscuit than a crumble and the focus is really on the peaches. Unfortunately, there is a typo in the recipe so I’ve had to make some executive decisions. The ingredient list calls for one and one quarter cups of sugar, but the directions only have you use one cup. I think the biscuit could be a little sweeter so I decided that the extra quarter cup should go there. The cookbook is decent, but you can definitely tell that it’s her first one. 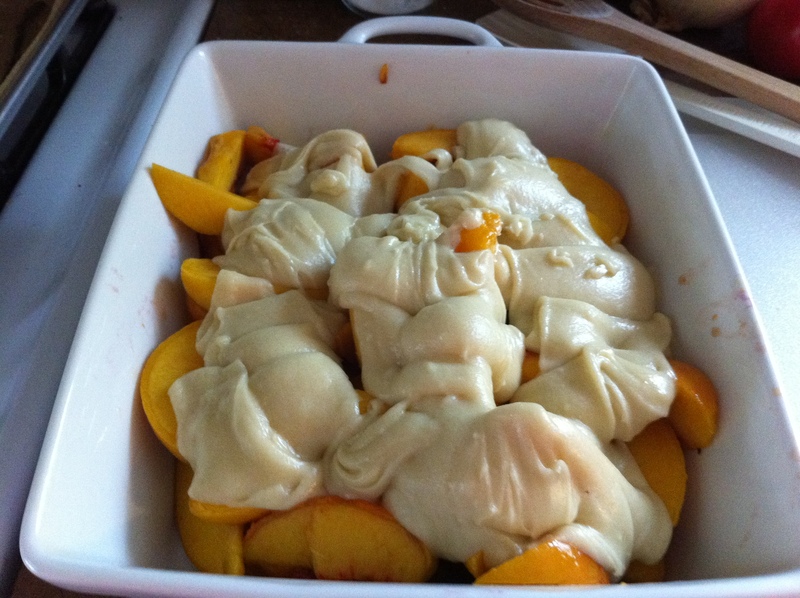 For example in this recipe it says 4-5 peaches, peeled and sliced. Ok, how thick should they be sliced? Thinly sliced? Thick wedges? 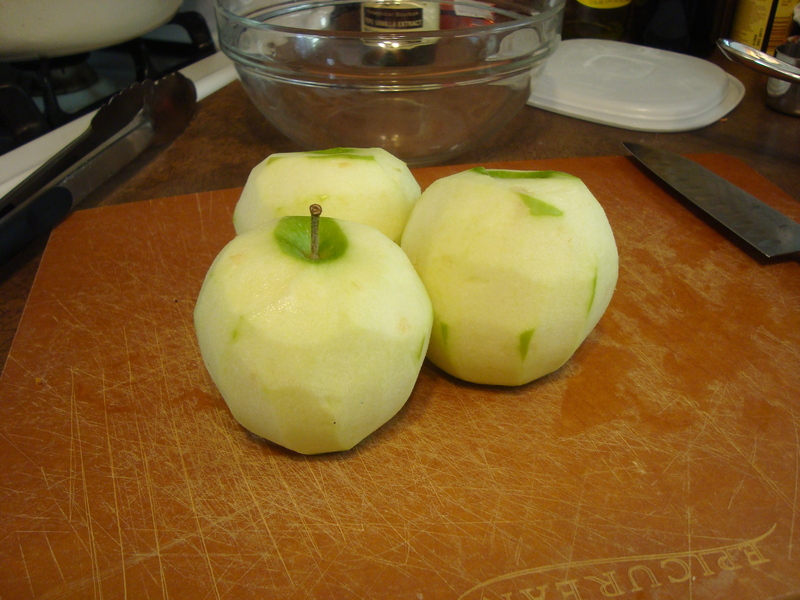 Also, peaches are practically impossible to peel, so how about a trick (which I included below, courtesy of Ina Garten)? If you like southern food, it’s worth a read, otherwise, you can just borrow mine. To prepare the peaches, bring a large pot of water to a boil and drop the peaches in for 30 seconds. Take them out and put them in a bowl of very cold water to stop the cooking. When they’re cool enough to handle, the peels should slide right off. WARNING: Naked peaches are very slippery! Be careful when you’re slicing them. Slice the peaches into 1/2 inch wedges. 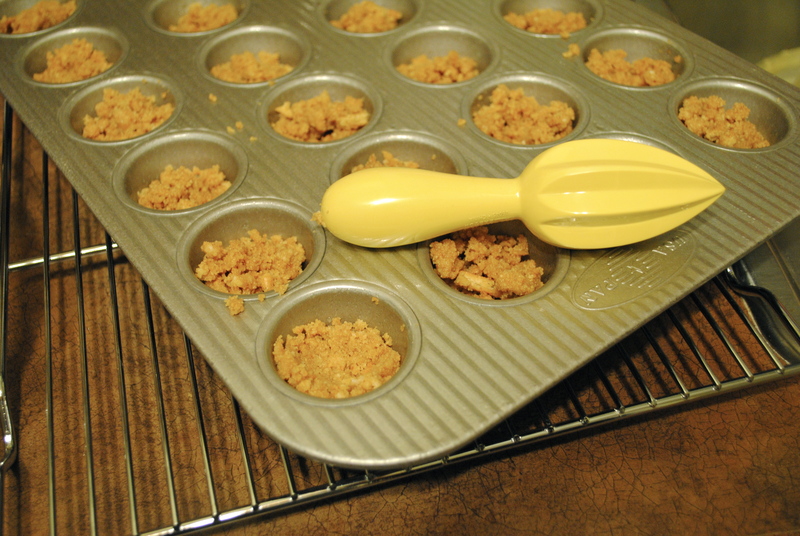 Place them in an 8×8 or 9×9 baking dish. 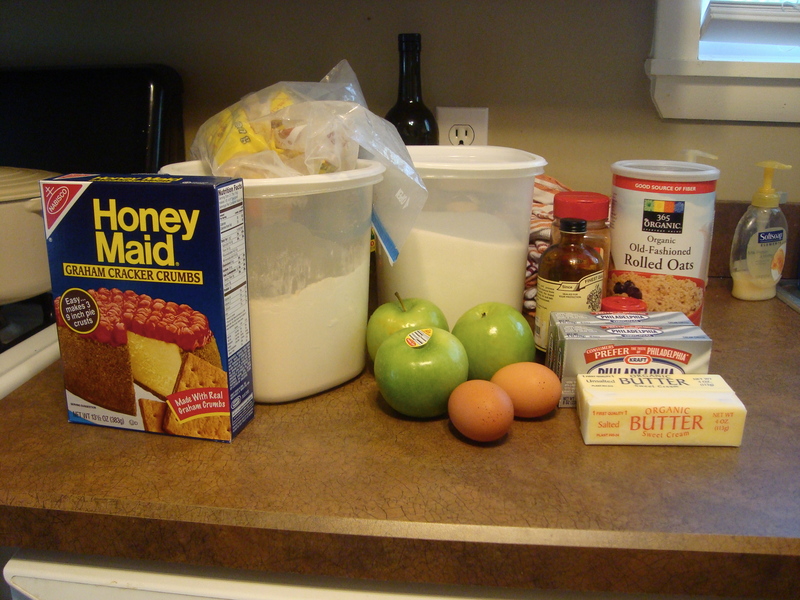 In a medium bowl, whisk together 1 cup of the sugar, the flour, the baking powder and 1/2 teaspoon of salt. 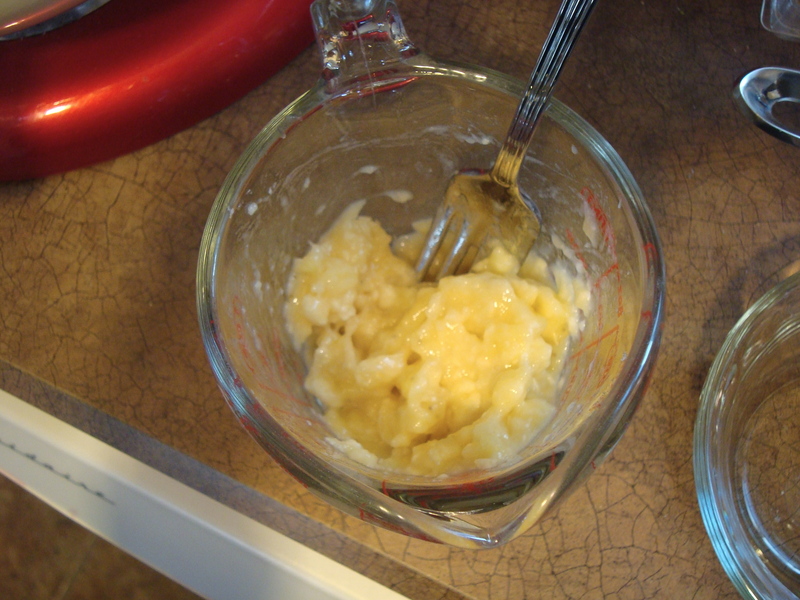 Add the milk and melted butter and mix together. Evenly pour the batter over the peaches. In a small bowl, whisk the remaining sugar with the cornstarch and 1/2 teaspoon of salt. Sprinkle it over the batter. Evenly pour the boiling water over everything. This will mix with the dry ingredients to make a nice sauce for the peaches. Bake for 50-60 minutes until the top starts to brown. Serve warm. I’ve had it for breakfast for the past three mornings – it’s fruit! So let’s pretend that no one cares about fat, cholesterol, sugar, or cellulite. Pretending? Ok, now you can make these cheesecake bars. 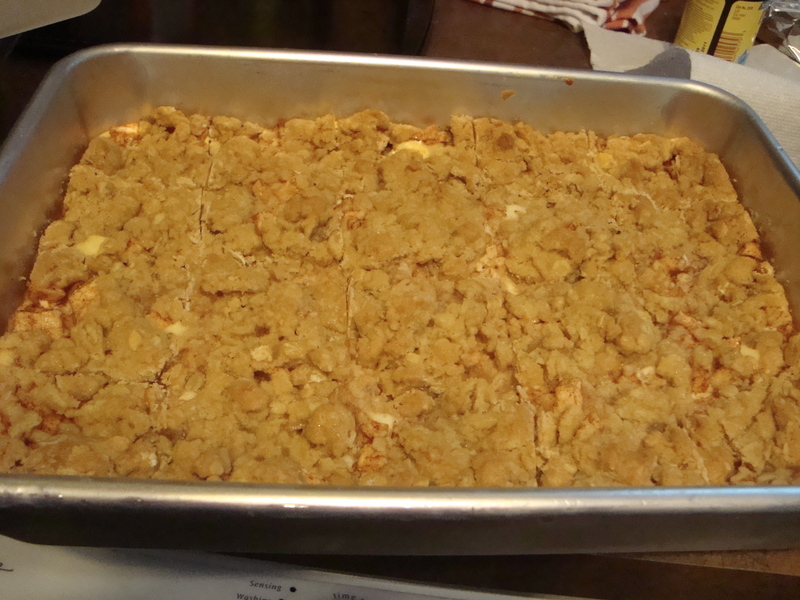 Paula Deen’s Caramel Apple Cheesecake Bar recipe is here. It’s pretty good as is, but it has three sticks of butter and a completely unnecessary caramel sauce. I changed the crust to a graham cracker one and took out the sauce. It’s better (and less fattening). I know it looks like a lot, but it’s not difficult, it’s just a matter of assembling all the parts. Preheat the oven to 350. Combine the crust ingredients and mix together with a fork. Gently press it into a 13×9 pan. 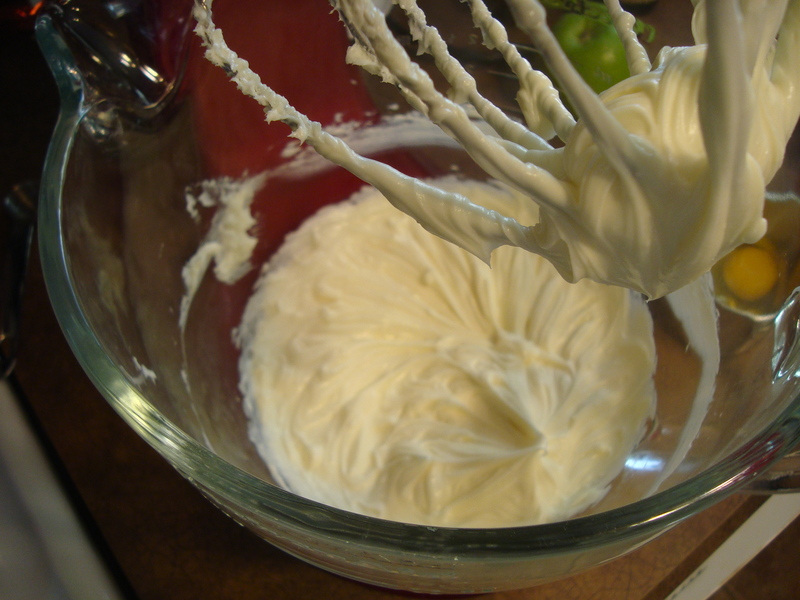 To soften the cream cheese, microwave it for 15-second increments until it’s a little soft. You DON’T want to cook/melt it. 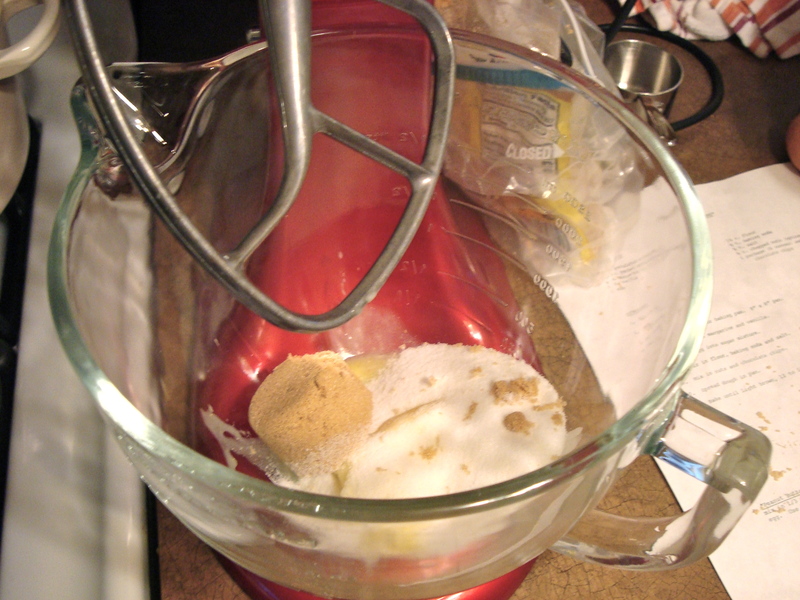 Combine the cream cheese with 1/2 sugar and mix on medium speed until they are smooth and combined. Add the eggs, one at a time, and the teaspoon of vanilla. 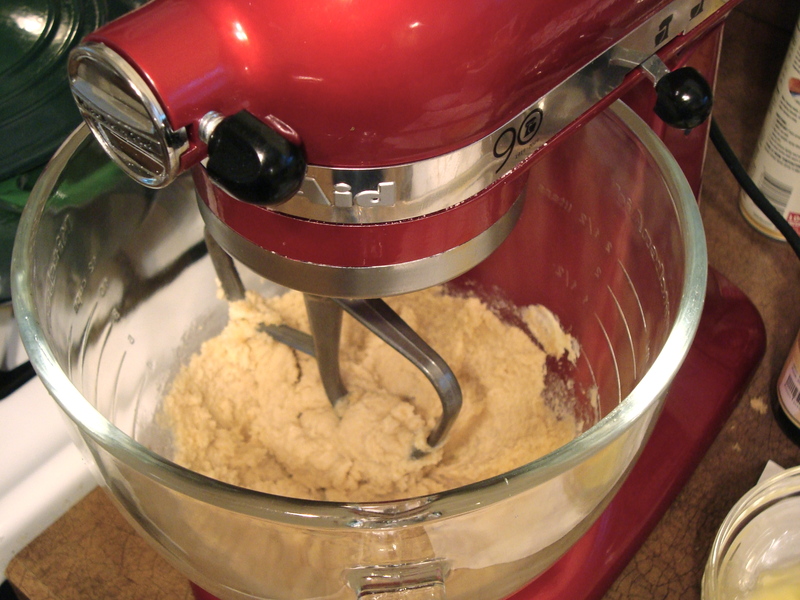 Mix until it’s a smooth batter consistency. Carefully pour over the crust. 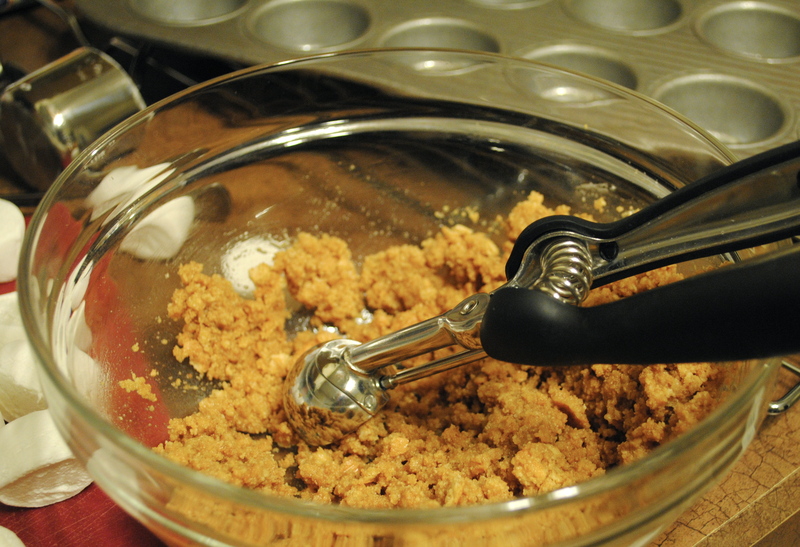 Smooth it out with a large spoon but be careful not to scoop up the crumb bottom with it. 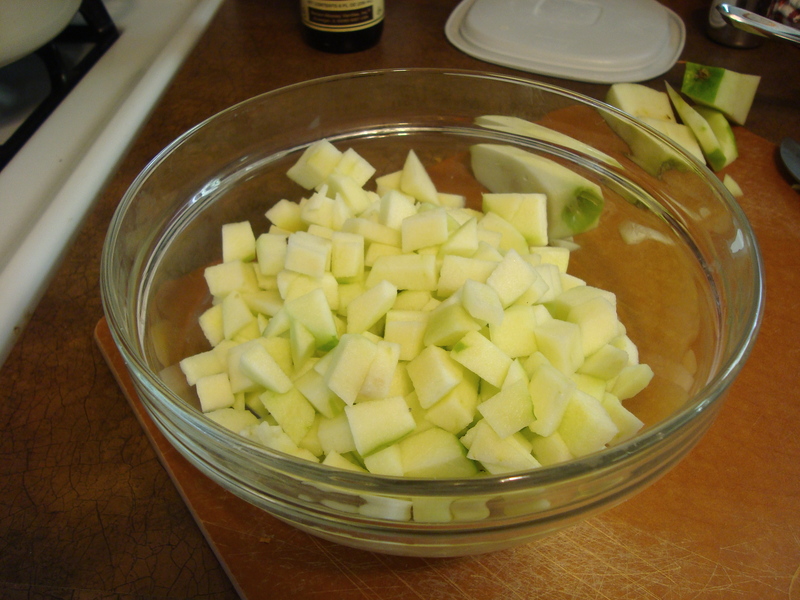 Peel and chop the apples and stir them in a bowl with the sugar, cinnamon and nutmeg. Sprinkle them over the cheesecake. 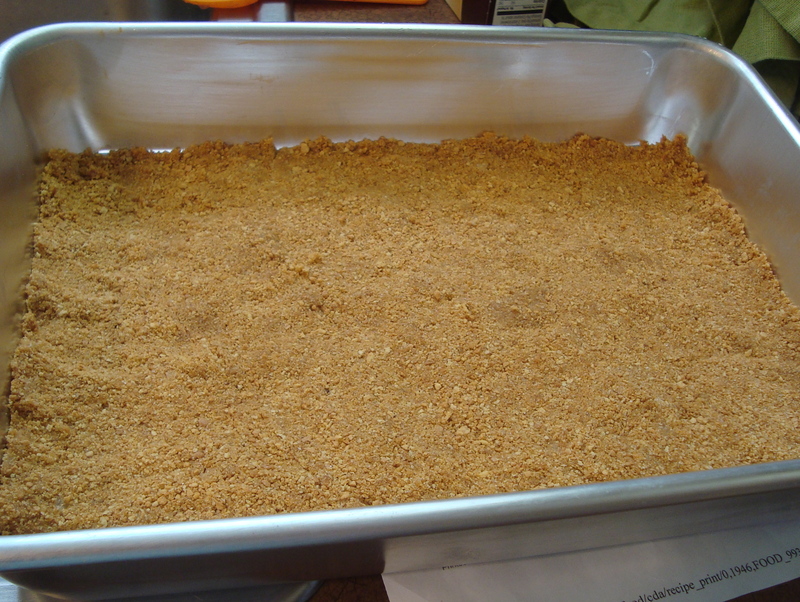 Combine the melted butter, flour, brown sugar, and oats and make crumbs with your hands (or a fork if you’re feeling prissy). Sprinkle the crumbs over the apples. Bake for 30-40 minutes until the center is set and a toothpick comes out (mostly) clean. 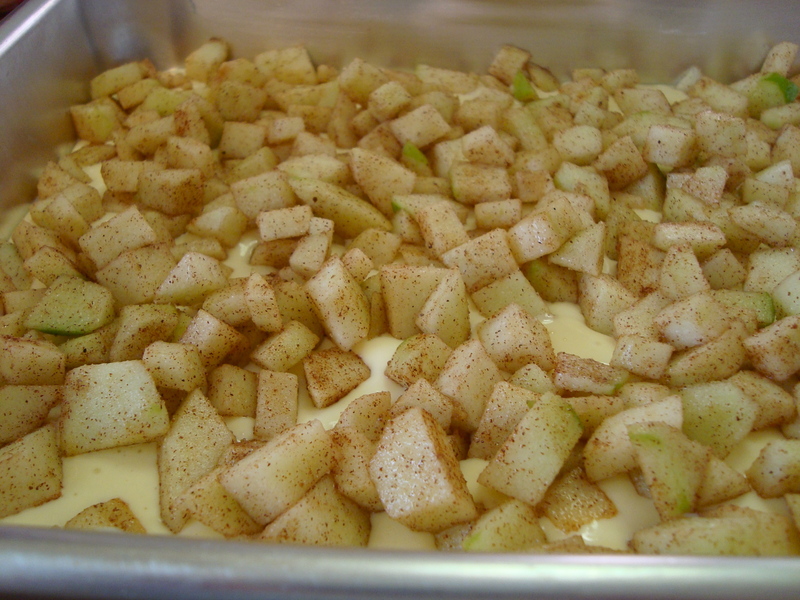 Let cool for 30 minutes or so and refrigerate for several hours before serving. Chocolate chip bars, where have you been all my life? At an after school meeting I helped myself to two chocolate chip squares prepared by the Home and Careers teacher. That night I emailed her demanding (delicately requesting) the recipe and on Friday it arrived on my desk. Three batches later I am HOOKED. 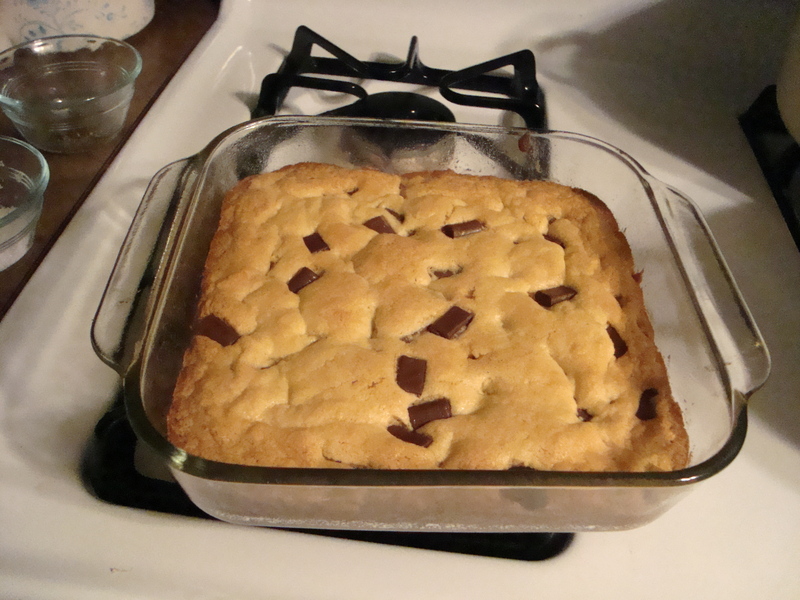 It’s like a blondie with chocolate chips and it’s chewy and salty and practically perfect. Make them immediately. 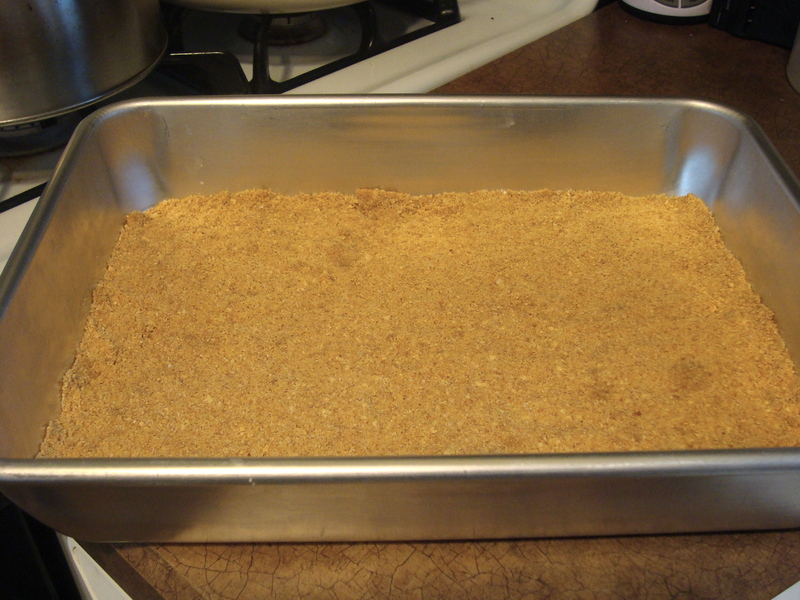 Preheat the oven to 375 and grease an 8×8 pan. The butter needs to be softened so ideally you would have left it on the counter for a day. If you didn’t, cut it into thirds and microwave for ten-second increments until it’s soft. While some of it may melt, you do NOT want a stick of melted butter. That would be bad. Combine the butter, granulated sugar and brown sugar in a bowl and beat for a minute until the ingredients are combined and the dough is fluffy. Add one egg and the teaspoon of vanilla and beat on low speed to combine. In thirds, add the flour, salt, and baking soda. Wait for each third to incorporate before adding the next. 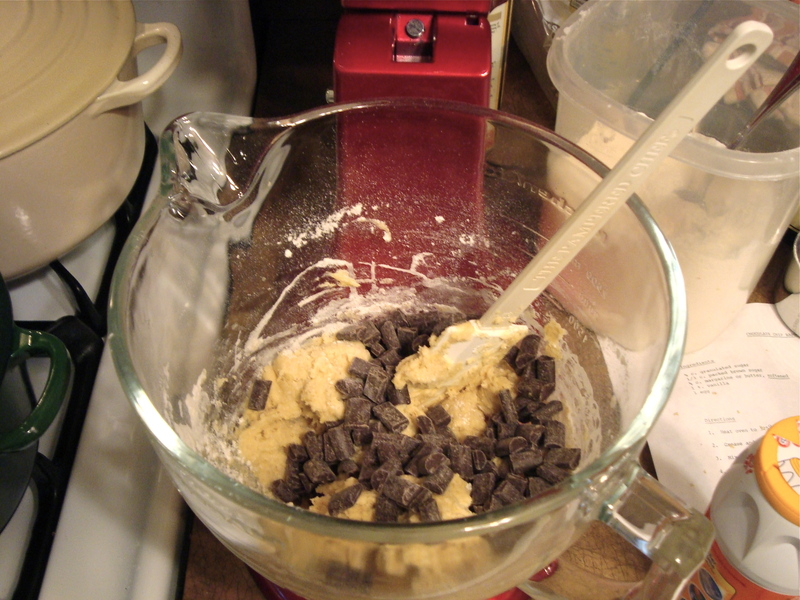 With a large spoon or rubber spatula, stir in the chocolate chips (I only had chunks in the house). Spread the dough into the pan and sprinkle on a few more chips. Bake for 14-18 minutes. It should be lightly browned and a toothpick tester should come out clean. I should have added more chips on top to this one. 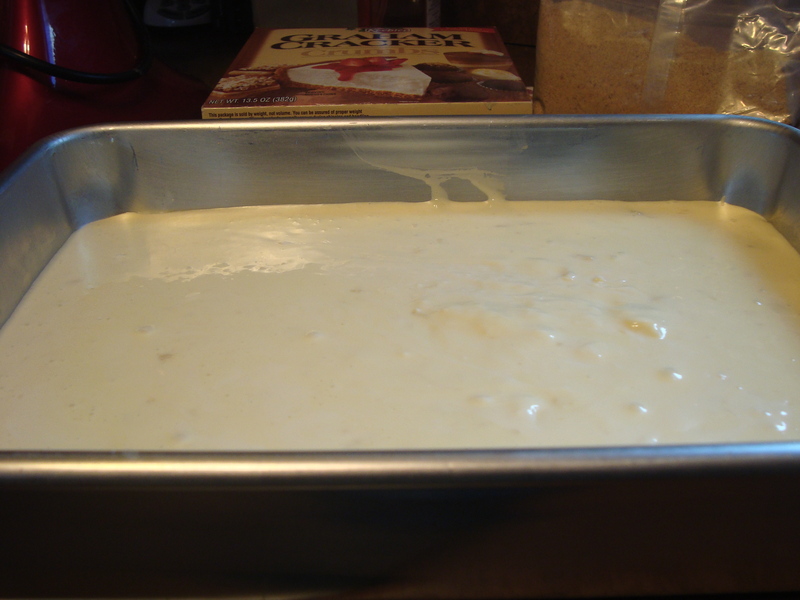 Let it cool for 20-30 minutes and then cut into squares. Get ready to have a lot more friends after you make these.